Southern Hood Canal is back to its dirty tricks again, as dissolved oxygen concentrations have dropped to dangerous levels even at the surface. Numerous researchers are watching to see how these conditions play out. 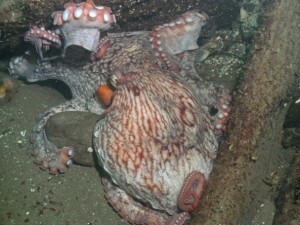 A giant Pacific octopus, which should be hiding, clings to a rock wall Saturday at Sund Rocks Marine Preserve. The mechanism that causes the oxygen to decline is a little complicated, but it’s pretty well understood. It involves nitrogen, sunlight, plankton, heavy sea water and south winds. See the story I wrote for today’s Kitsap Sun for a brief explanation, or check out a story from April 12, when I described findings from a scientific panel about the sources of nitrogen in the canal. 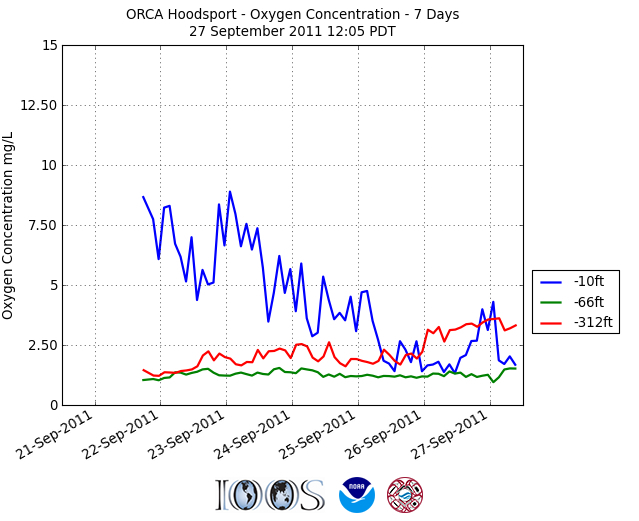 The graph below shows the oxygen levels at three depths near Hoodsport. As you can see from the blue line, oxygen levels near the surface declined rapidly over the past five days, a period when winds blew out of the south. Levels below 2.5 milligrams per liter are considered highly stressful for sea life. At Hoodsport, oxygen levels rose at the 10-foot mark starting about midday yesterday. They declined again this morning, starting after midnight. Being close to the surface, oxygen levels in these waters are greatly influenced by winds and waves. Waters at 66 feet deep stayed low in oxygen but fairly stable, as shown by the green line. Fish tend to swim into shallow waters to avoid those low-oxygen levels. A huge mass of low-oxygen water lies in this mid-range area. Meanwhile, the low-oxygen waters in the middle layers are being pushed upward by heavy seawater coming in from the ocean. That deep ocean water contains more oxygen than the layer above it, as shown by the red line. To follow these changes in close to real time, go to the Nanoos website and click on “Click here to view all assets” then on “regions” in the left column and “Puget Sound.” You can get information from most of these buoys. Hoodsport is the closest to the action in southern Hood Canal.